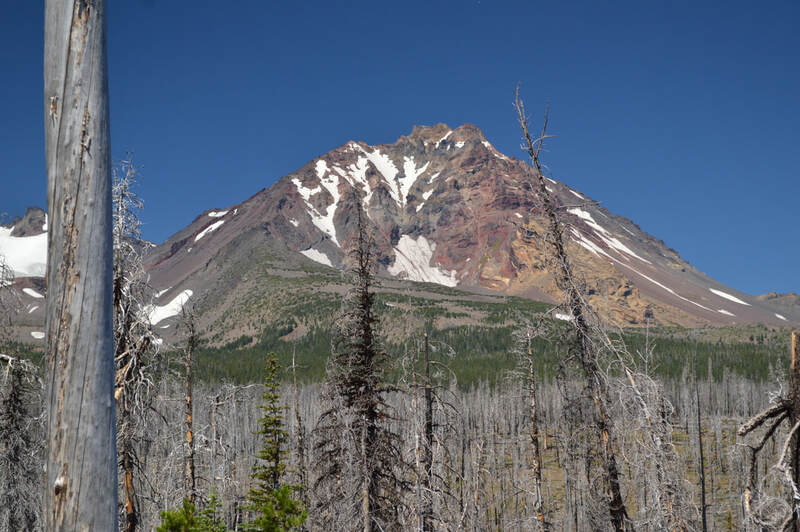 The Three Sisters Loop is a very popular backpacking destination ranging from 50 to 60 miles. 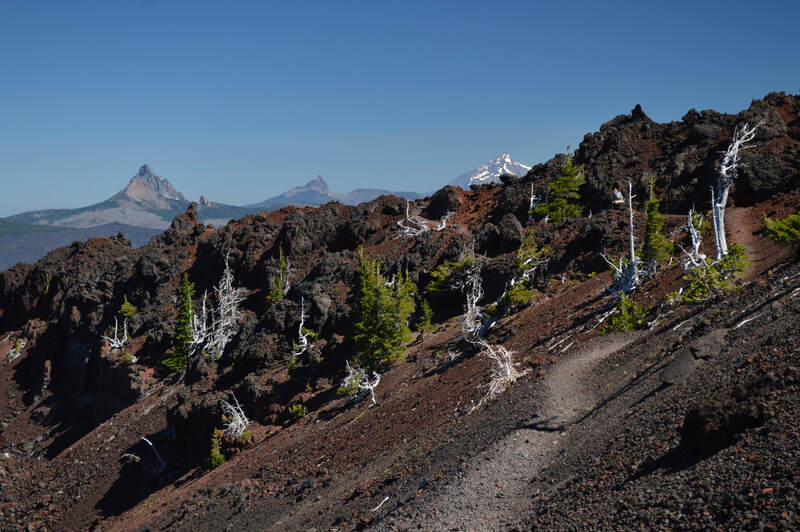 The mileage depends on what trailhead you start at and whether or not you do any of the side excursions that are so alluring long this trail. 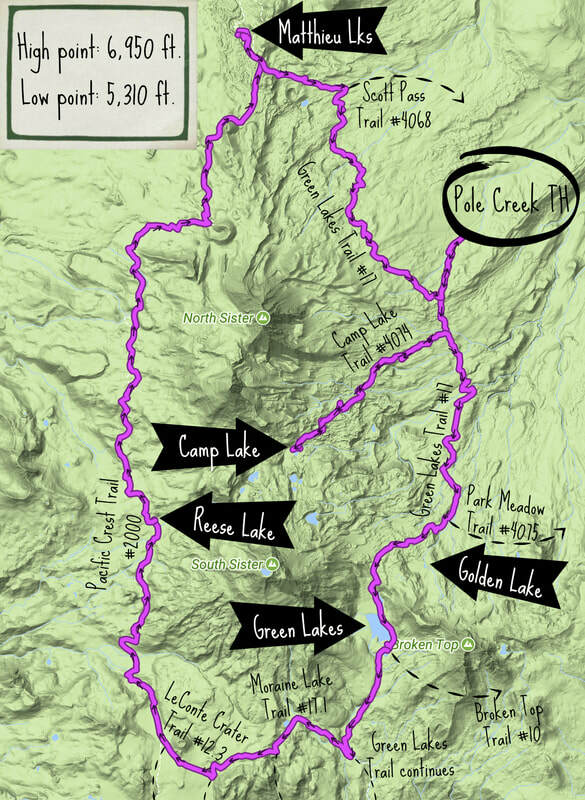 This write-up starts at the Pole Creek trailhead and goes clockwise around the Three Sisters with a side excursion to Camp Lake, which makes the loop 60 miles instead of 50. From the Pole Creek trailhead take the Pole Creek Trail #4072 for 1.6 uphill miles until you get to a trail split. 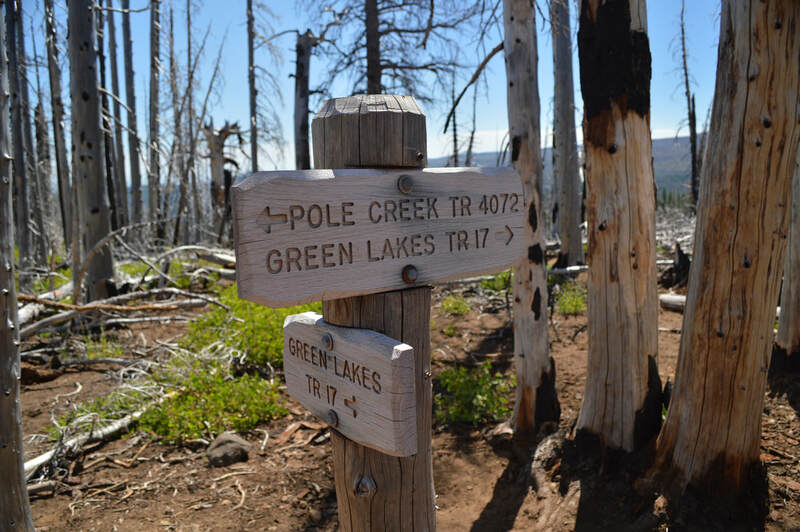 Here you will take a left onto the Green Lakes Trail #17 for another .6 miles before crossing Soap Creek and coming to another trail junction. Here you can choose to go up to Camp Lake if you want an awesome place to spend the night and if you have some extra time. 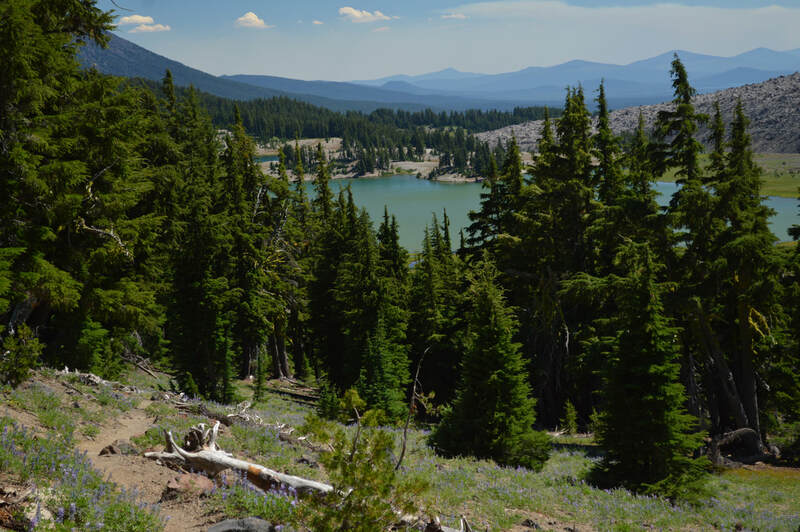 To go up to Camp Lake take the Camp Lake Trail #4074 uphill for 4.8 miles. 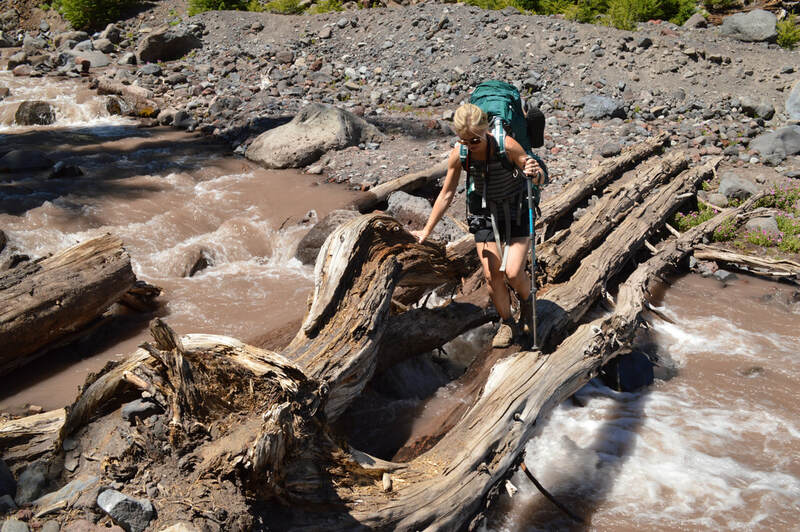 On the way to Camp Lake you will have to cross a few creeks, the largest one being North Fork Whychus Creek which flows heavier in the afternoon due to glacier melt. 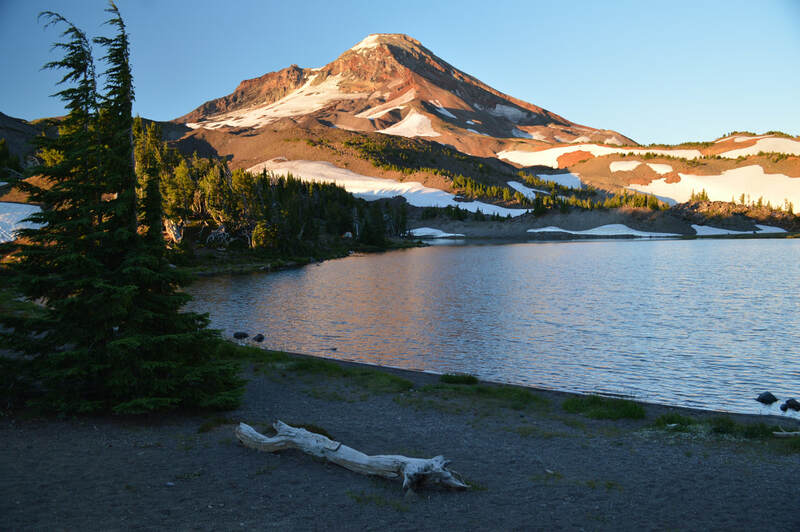 Camp Lake is situated in-between South and Middle Sister and there are about 6 places to set up tents in the area. 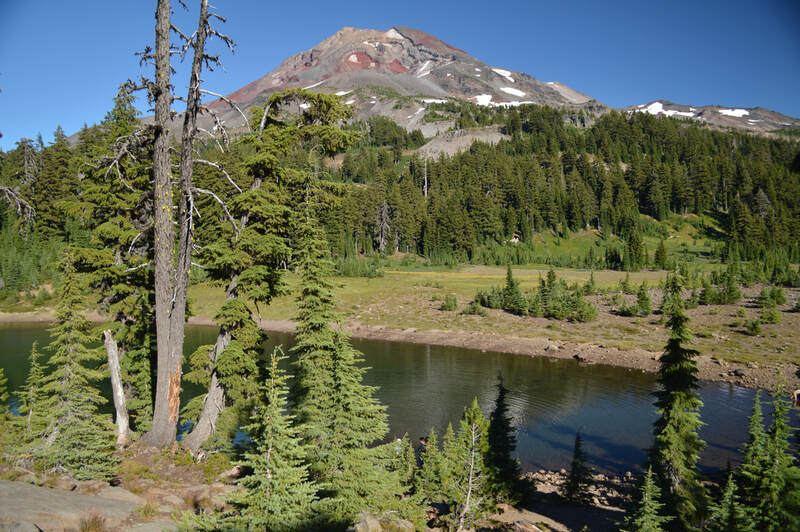 If you choose not to go to Camp Lake, continue on the Green Lakes Trail #17 south towards Broken Top and South Sister. 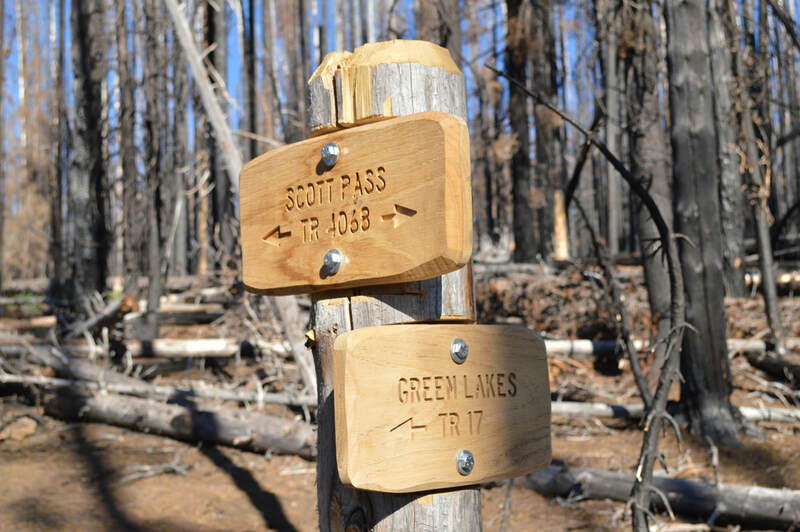 From the junction you will walk 5.1 miles through the Pole Creek burn from 2012. The silver trees leave the trail very exposed and this section of the hike can get very hot. After 5.1 miles you will reach Park Meadow and East Fork Park Creek, a welcome reprieve from the hot sun and a chance to re-up on some water. 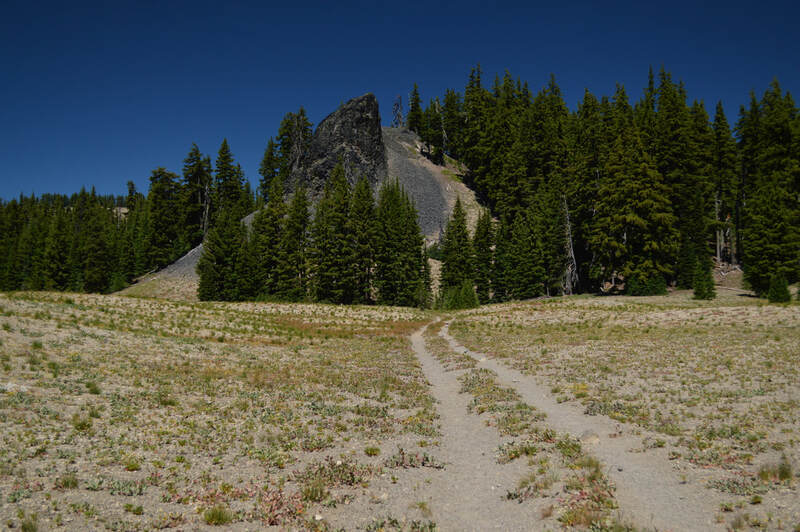 Continue up the Green Lakes Trail through the meadow, heading up to a ridge. 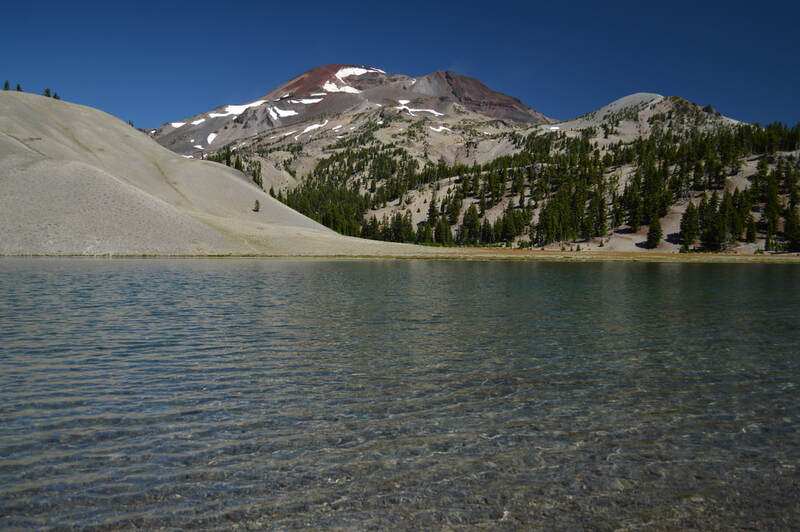 About a mile from Park Meadow you will see a rock cairn, which marks the turn off to Golden Lake, a pristine alpine lake with Broken Top looming over a golden meadow. 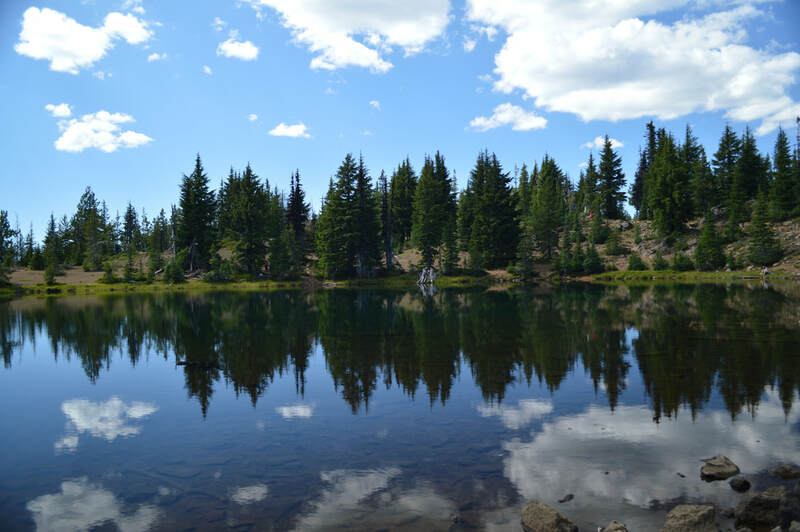 Golden Lake has plenty of camping options if this is where you're wanting to set up your tent for the night. 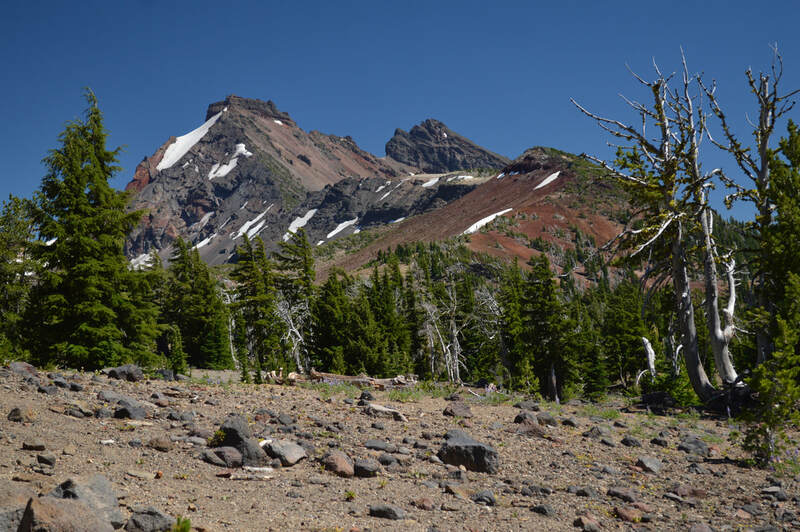 If you're choosing to camp at Green Lakes, continue another 4.6 miles up and over the ridge where you will see amazing views of Broken Top to the left and South Sister to the right. The descent to Green Lakes basin is a bit steep. You will reach a boundary sign which shows you all of the designated camp spots in the area. You are required to set up camp at one of the 28 sites if you choose to spend the night anywhere inside the boundary or risk a $100 fine. All of the campsites are marked by posts with the site number on it. The campsites can be a bit challenging to find, and they are all far enough away from other sites that you don't see any other campers from you're camp. 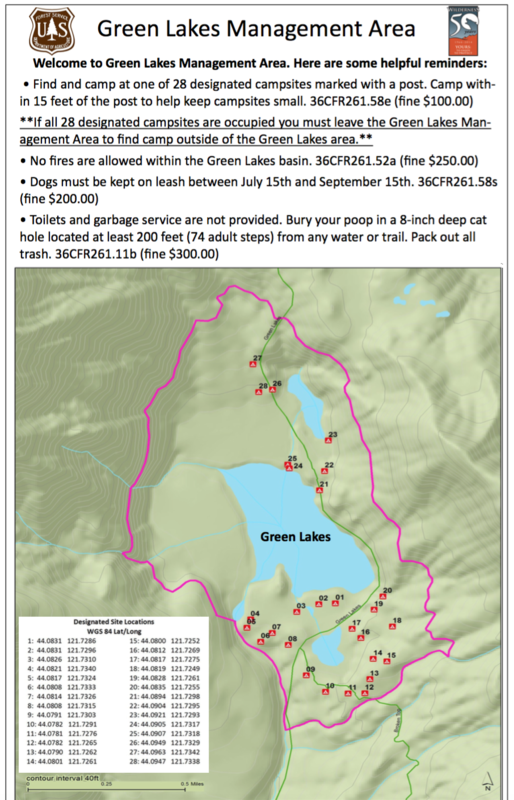 When camping here, please make sure to follow all Leave No Trace Principles, and you are not allowed to have any campfires within the Green Lakes boundary. From the Green Lakes basin you will continue on the Green Lakes Trail for 2.3 miles until you see a sign for Moraine Lake. 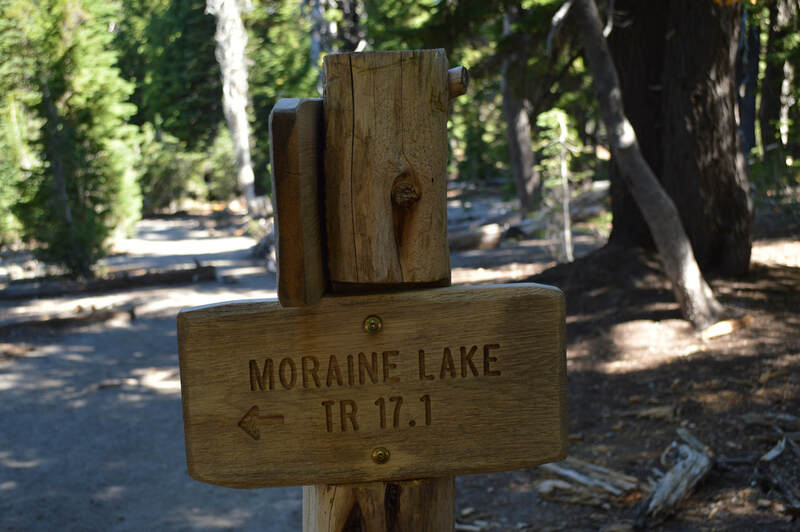 Take the Moraine Lake Trail #17.1 to the right for 2.5 miles. Moraine Lake also has a boundary and camping restrictions. There are only 10 designated campsites here. Moraine Lake is a great place to camel up on water before continuing on the Moraine Lake Trail #17.1 for another 1.5 miles. 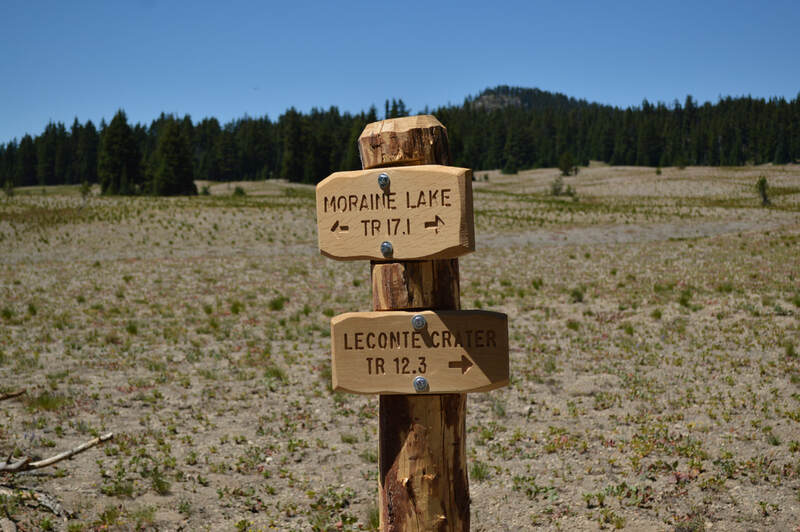 You will come to a three-way junction and you will take a right on the LeConte Crater Trail #12.3 for a short 1.3 miles. 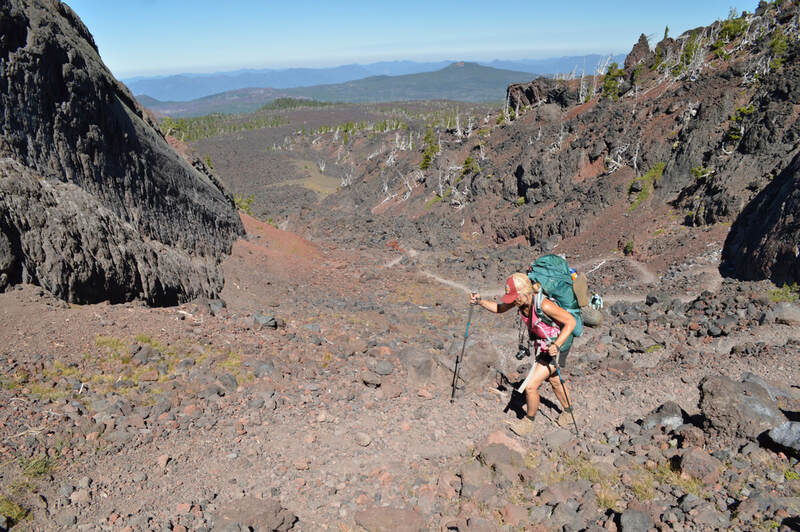 The LeConte Crater trail is very exposed and the trail has been walked on so much that it has become deep sand. 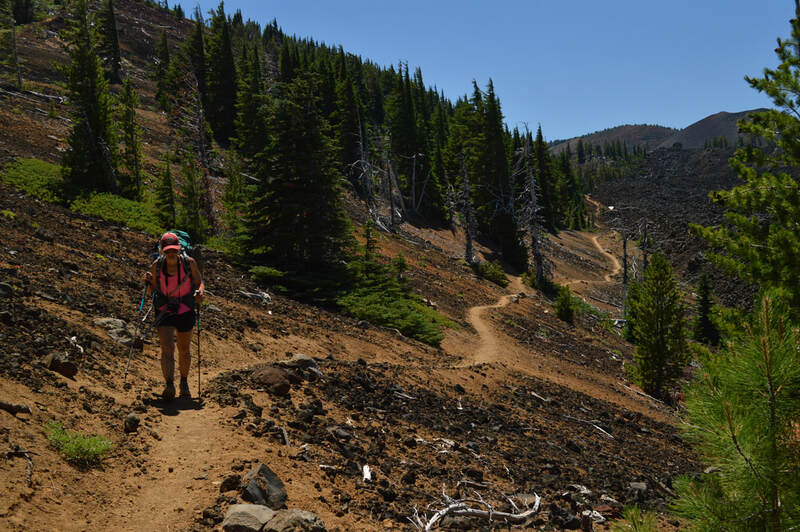 The LeConte Crater Trail dead ends into the Pacific Crest Trail. Here you will take a right, and you will now be heading north. After passing Rock Mesa, the trail enters the forest again. 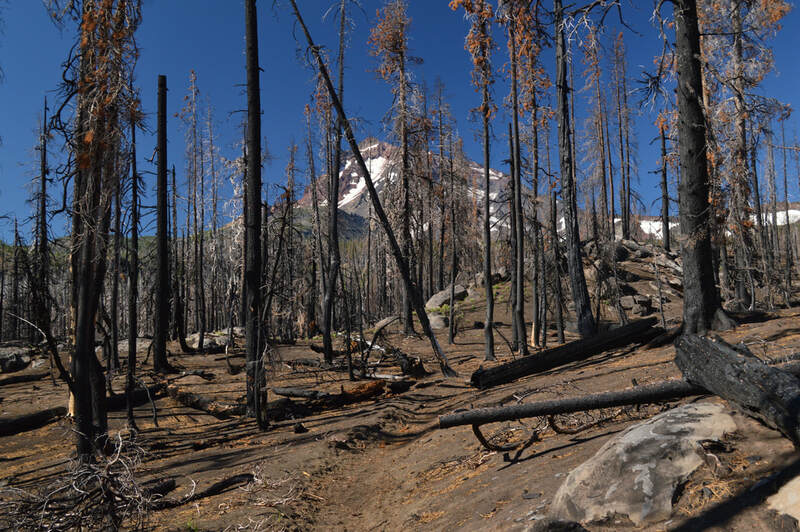 Unfortunately after Mesa Creek, the forest is severely burned from the 2017 Nash Fire. Watch your step here, and do not go off trail. 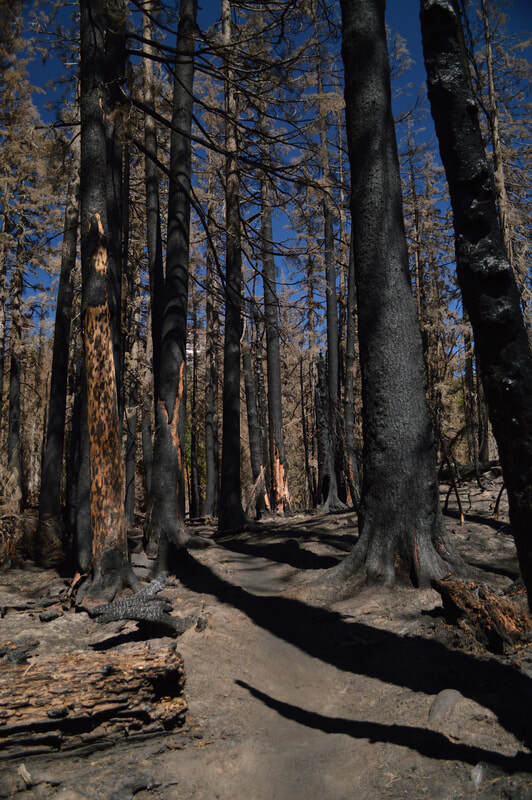 The fire burned the roots of the trees and has burned deep holes into the ground that you sometimes can't see. Also watch for falling limbs, as they can crash to the ground even with limited wind. 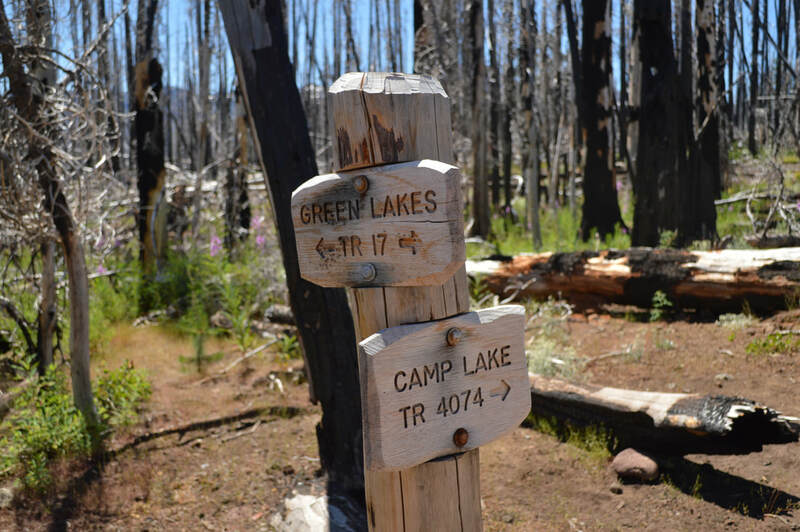 The Nash Fire burn connects to the Separation Fire, also from 2017, and after walking through burn for about 6.3 miles you will arrive at Reese Lake. This is a wonderful spot to camp, with room for about 12 tents (although the spots are close together). 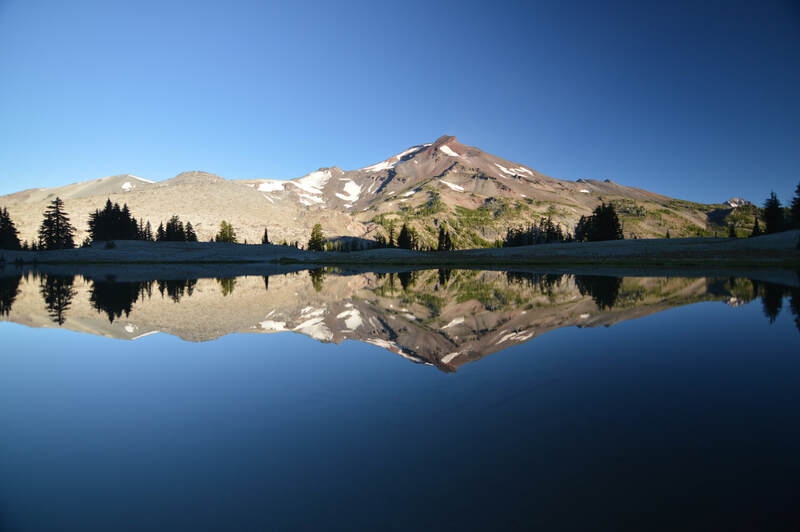 The views of South Sister are spectacular, and Reese Lake is shallow and often very warm in the summer months. 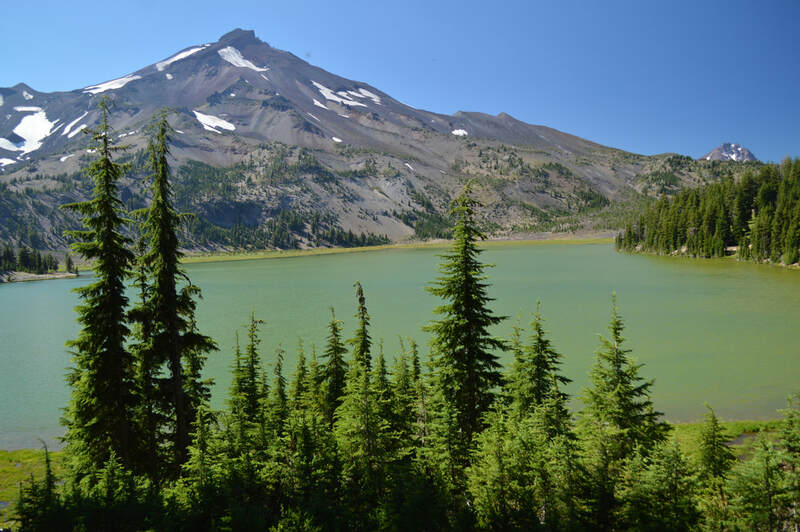 From Reese Lake continue north on the Pacific Crest Trail through many wildflower meadows and stunning views of Middle and North Sister, as well as The Husband. 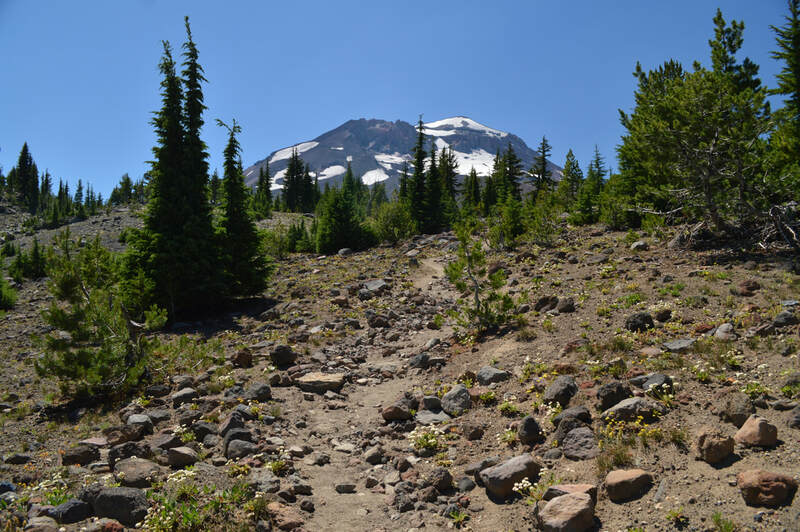 You will also see signs to Linton Meadows, another popular side excursion from the Three Sisters Loop, where you can hike around The Husband, adding about 5.2 miles to the trip. 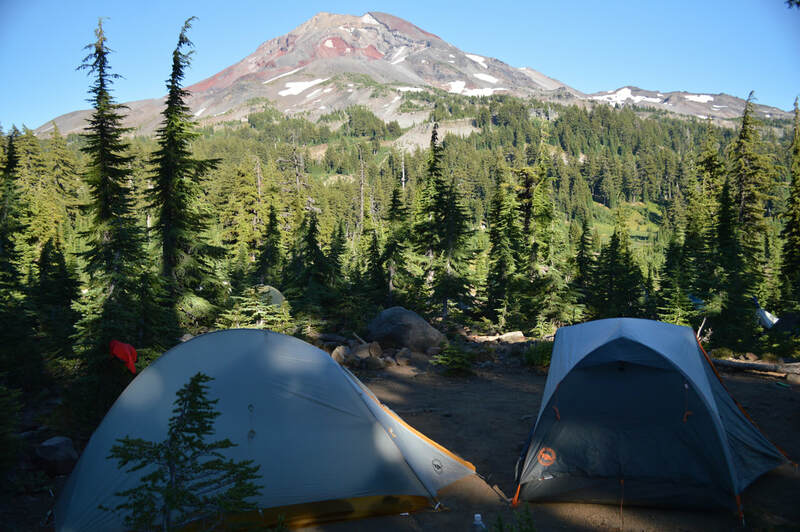 Crest Trail, however you are not allowed to camp here without purchasing a Limited Entry Permit. 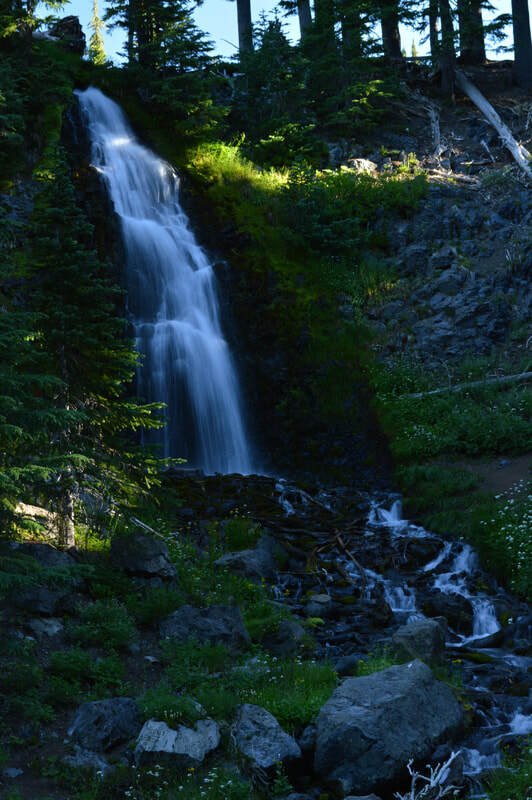 ​Obsidian Falls is a refreshing little waterfall which originates just up the hill at pristine Sister Springs, a place where the water bubbles out of the side of the mountain. You will not get better water on the whole trip as you can here! About 2.3 miles past Sister Springs you will enter the lava section. Sawyer Bar is steep and rocky, but just take it slow. 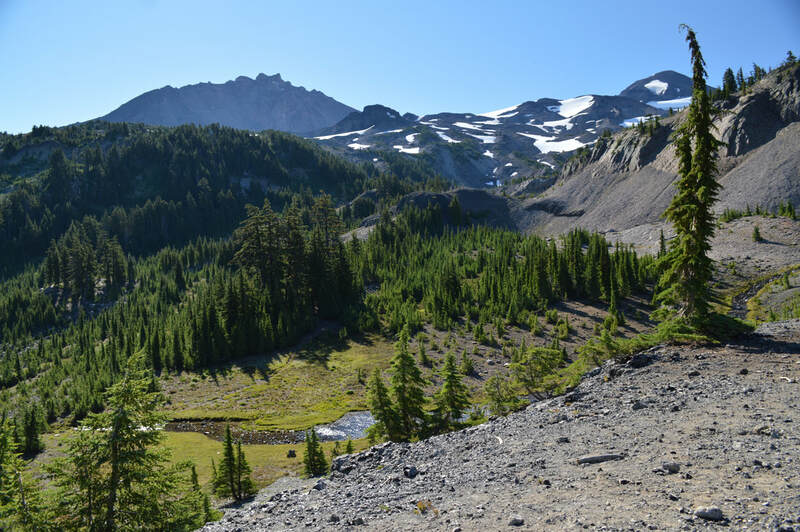 Once you get up to Opie Dilldock Pass, you are at the top and the views to the north are incredible! You will be able to see Mt. Washington, Mt. Jefferson, Mt. Hood and on a very clear day even Mt. Adams. The entire lava section here is only about 2 miles long. 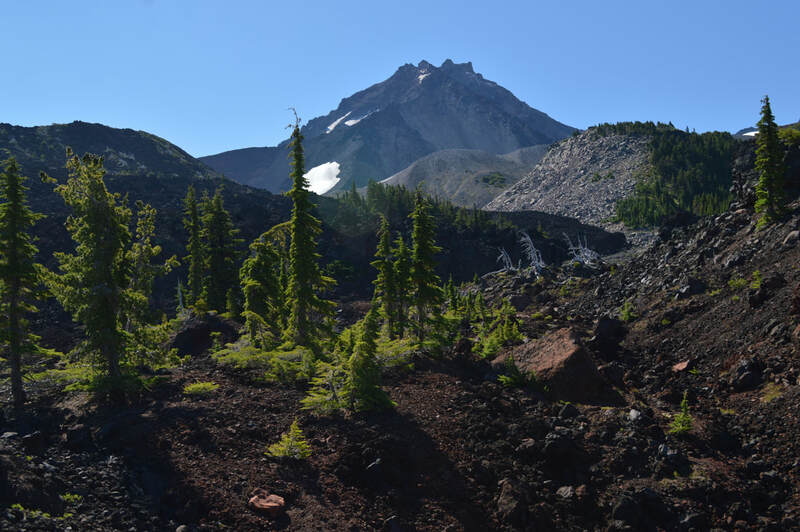 There is another very short lava section right before the trail reaches South Matthieu Lake. 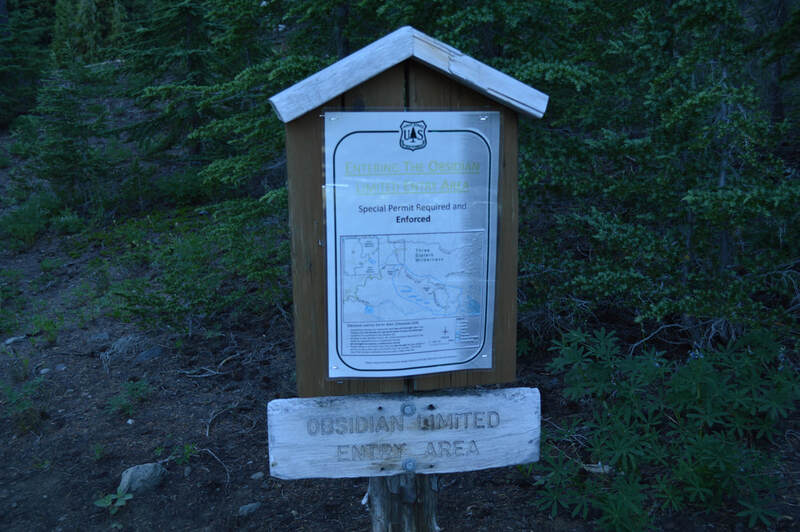 On weekends this area is extremely crowded since the lakes are only 3.3 miles from a trailhead. 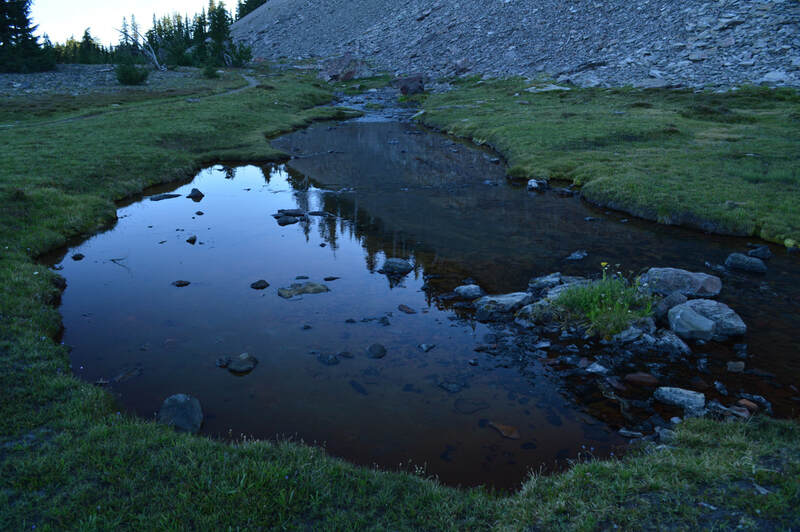 South Matthieu Lake only has 3 designated campsites and North Matthieu Lake has 7. 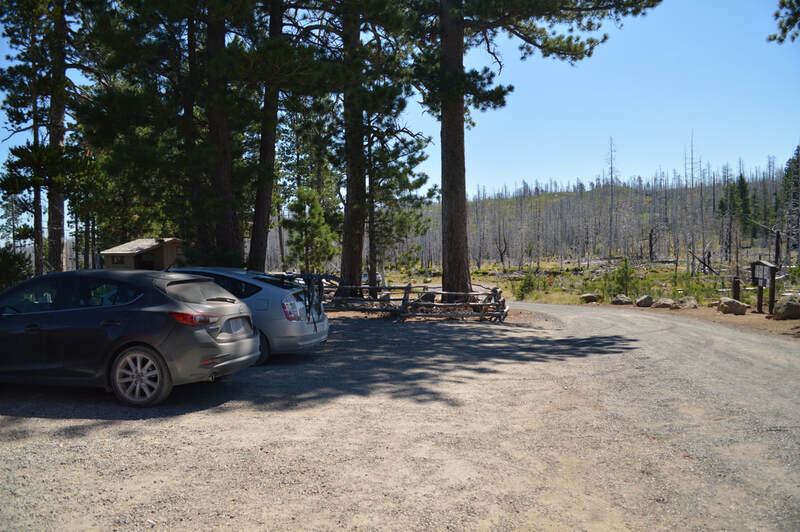 The sites at North Matthieu Lake are all extremely large, so even if you can't find an empty campsite, if you are just one or two people, it is worth asking another group of campers to share the site. 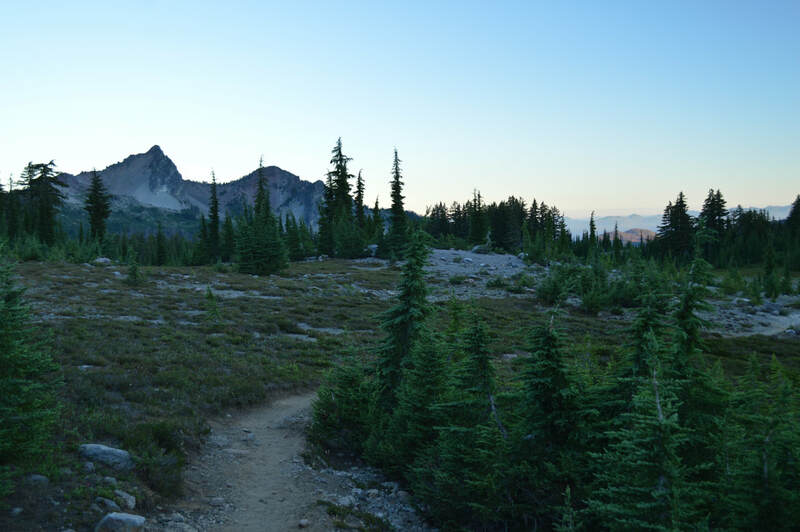 After spending the night at Matthieu Lakes, head back up the hill just south of South Matthieu Lake to Scott Pass. Take the Scott Pass Trail #4068 downhill 2 miles. 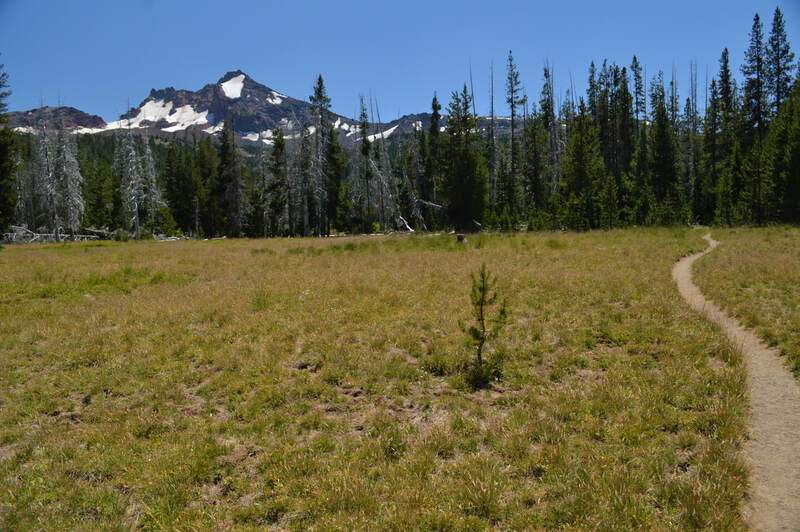 Here you will enter the Milli Fire burn area, also from 2017. This area is burned so badly that you can hardly see where the trail is. After 2 miles you will see a brand new sign and you will head south back on the Green Lakes Trail #17. From here it is 6.6 long miles through new burn which fades into the Pole Creek burn, and walking on what feels like very fine sand. The trail goes over one ridge after another, gaining almost 1,000 ft. of elevation. 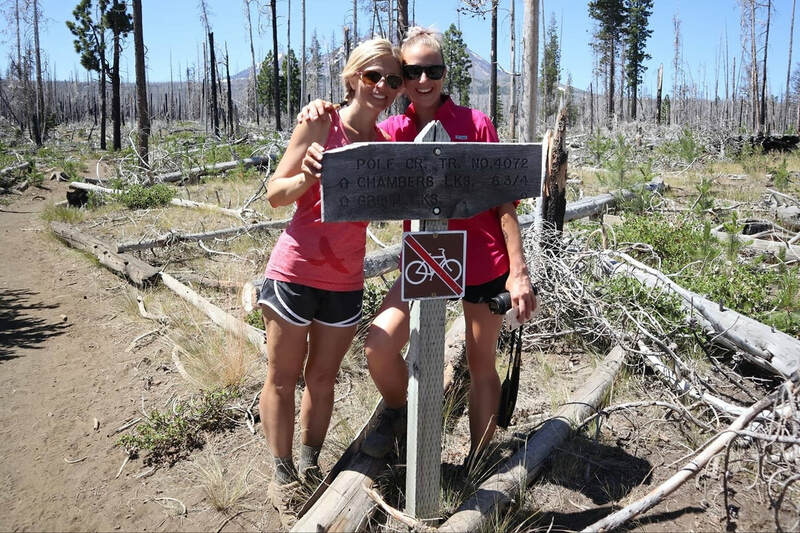 When you come to the sign for the Pole Creek Trail, you have completed the loop, and now you will continue downhill 1.6 miles back to the trailhead. Overall, this loop is challenging but it has so much to offer and can be a very short trip or a week long trip. The options for creating the perfect backpacking trip are endless with the various side trips one can do. The terrain is moderate, with the most difficult part being the short lava section. The mosquitoes are heavy throughout this entire area, so avoid going in late June and early July. Mosquitoes can linger into mid and late July depending on the year but they are not going to be as bad. There are also some biting flies around the lakes but nowhere else. (Best time to go is August to mid-October. Avoid the month of July due to mosquitoes in the area). Directions: Drive 1.4 miles west of Sister on highway 242 and then turn left onto NF-15 for 10.5 miles. The last 8 miles of NF-15 are gravel. The road is not rough, but it does get very dusty and the gravel tends to be pretty loose. 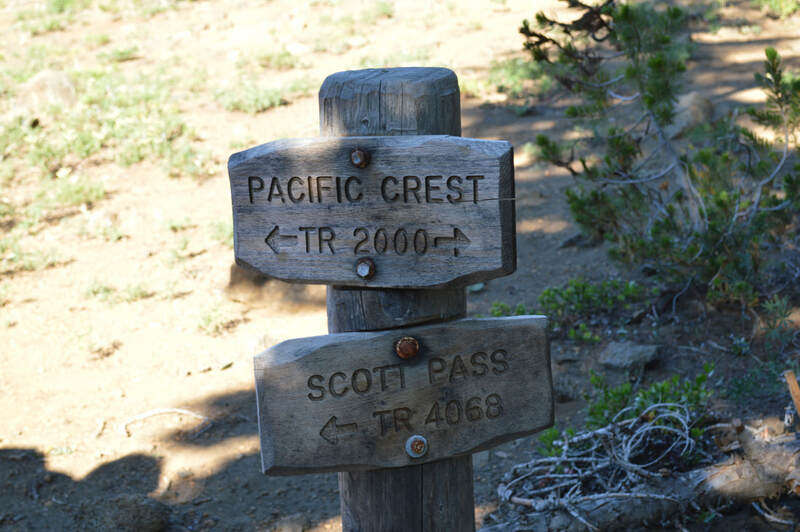 Follow signs to Pole Creek trailhead and park there. 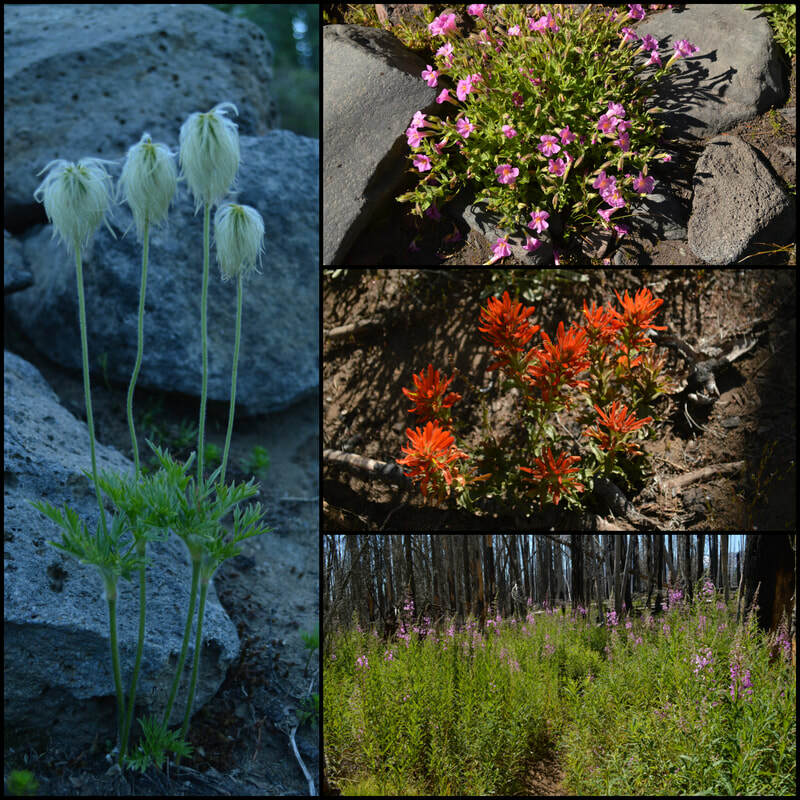 You will need your Annual Northwest Forest Pass, or pay $5 at the trailhead if you don't have one. ​​To get a more in-depth and personal view of this hike, watch the YouTube video.